Spanish house prices rose on a quarterly basis at the end of last year, according to data from the Housing Department (part of the Ministry of Public Works). That is the first quarterly rise since Q1 2008, explains the Spanish daily El Pais. Average house prices increased 0.5 per cent between Q3 and Q4 last year, mainly due to upward price pressure on resales, which now account for two thirds of the housing market. Peak-to-present, Spanish housing has last 31 per cent in nominal terms, and 37 per cent in real terms, all according to the Housing Dept. figures cited by El Pais. 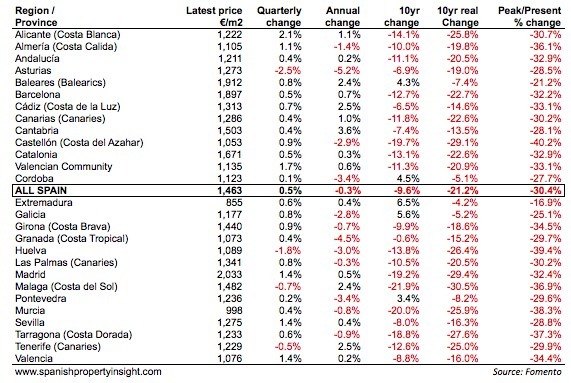 The average property price at the end of Q4 was €1,463.1 per square metre. On an annualised basis prices were still 0.3 per cent lower than a year before. 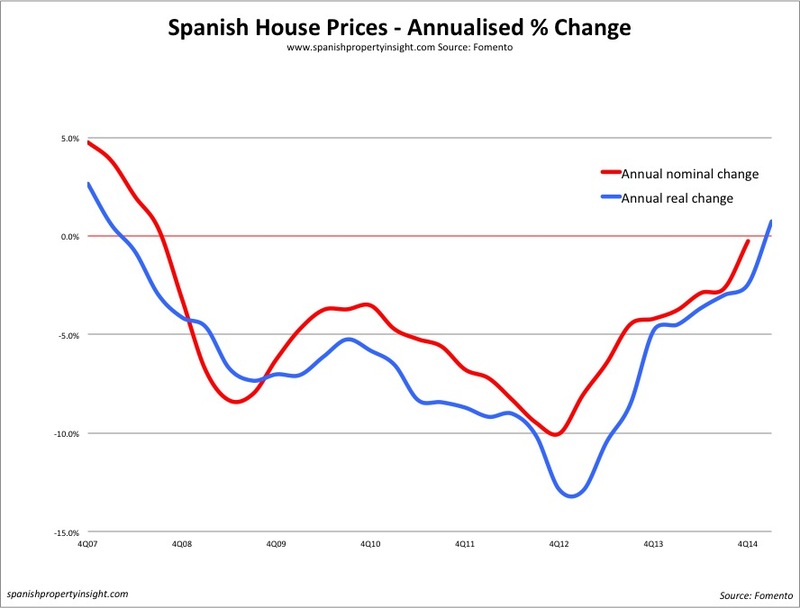 The Spanish house price crash, which started in 2008, and accelerated to declines of 10 per cent in 2012, “has practically come to an end,” claims the Government. Furthermore, seven autonomous regions experienced year-on-year price increases. The most expensive city in Spain is still San Sebastián in the Basque Country, with an average price of €3,117 per square metre, followed by nearby Getxo (€2,696), Calvià in Mallorca (€2,526), Alcobendas in Madrid (€2.477), Pozuelo de Alarcón in Madrid (€2,471), Barcelona (€2,416) and Majadahonda in Madrid (€2,399). Another sign of improvement in the property sector is the increase in new building permits, up 2 per cent in 2014, bringing seven years of declines to a close. In the breast of the believer hope springs eternal! Look again at how the so-called rise is calculated. If you want to be sure if it is raining go outside. Why then does IMIE published by Tinsa say they fell on average 4.5% at end 2014 and Idealista say they fell in January 2015?Kyero show so many differing reports how on earth can people know what to believe? I would believe my instinct and logic, which tells me that because of the low volume of sales and the amount of property lingering on the market it is a fairy tale.